Intensive attention has been paid to electroluminescence from the ZnS:Tb,F thin films because they have high feasibility to develop a green emitting device in a full color display panel /1/. A laboratory model of the device exhibits a luminance beyond 100 [cd/m2] at 60 [Hz] drive /2/. This luminance level is acceptable for practical applications. In addition to the technological approaches, efforts have also been made to clarify luminescent mechanisms in thin film electroluminescent devices /3–11/. 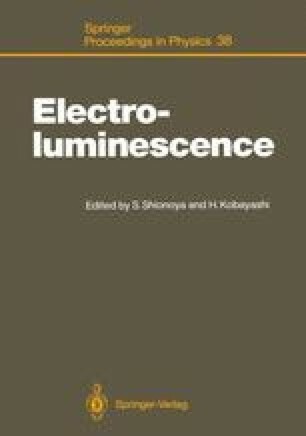 The unsolved problems, however, still remain in understanding the excitation mechanisms of luminescent centers, the carrier transport processes in high electric field, etc.